Manital, an Italian manufacturer of door and window lever handles, will be presenting its latest innovations at The Big 5, including Fenice, a new collection of classic handles. “The Fenice collection includes two new models available in many finishes: These include Victoria which recalls the Victorian style, with precious workmanship and ornamental patterns; and York, which echoes the neoclassical style, thanks to the rigorous and rational lines of the octagonal shape that characterises both the handle and the rose,” says a spokesman for Manital. Made from forged brass, the models are available in various finishes. Victoria is offered in Manital’s classical finishes and in new finishes of shaded black bronze, French gold red, French gold green, French silver red and ivory/gold shaded. York is available in classical finishes and new copper and satin copper. In addition to this new collection, Manital will be presenting other design handles, including Exa, Saturn and Ratio. Exa, designed by Mario Mazzer, is distinctive, thanks to its hexagonal section shape all over the handle which gives it a pleasant grip, the spokesman says. Made of forged brass, the elegant handle is available in all classical Manital finishes that makes it suitable for any type of environment. Saturn, designed by Mario Mazzer and Giovanni Crosera, represents a new concept of a rose that Manital offers combined with the Ratio handle. “Saturn is a rose that measures 180 mm wide and 152 mm high, making it highly visible on a door, therefore becoming its characteristic feature that perfectly suits both residential and commercial projects. “It is composed of two discs: one external, with a small semicircle extension to which the handle is attached and the other internal disk, having a diameter of 103 mm and available in various finishes and coatings. The internal disk can be customised through laser engraving of a logo for example, and can be easily replaced and purchased individually, thus becoming an element that can be renewed in time,” he adds. 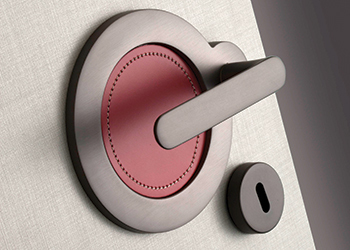 Saturn is offered in variants including the classic Manital finishes, leather coated or engraved on request. Finishes for the outer circle include chrome, satin chrome and anthracite; and for the internal disk, the classic Manital finishes, plus leather upholstery and micro Swarovski crystals. The Ratio handle, flat on the front and rounded on the back, with the two semicircle extremities, reproduce the curves of the rose, resulting in a harmonious whole. Also designed by Mario Mazzer, Ratio is made from forged brass and is offered in all of Manital’s classical finishes. Manital was launched in Vobarno near Brescia in Northern Italy, in 1990. “The company’s strategy, which has been strictly pursued till the present day, is to couple 100 per cent ‘Made in Italy’ design and production so as to combine aesthetics with innovation and quality,” says the spokesman. Manital’s wide portfolio of products comprises 60 ranges of handles for a wide variety of finishes with a total of 600 product choices. The spokesman says Manital ensures that each single product is manufactured with the utmost care employing only the best materials and with the help of the most sophisticated industrial technologies such as the die-forming technology. The designs of Manital products are produced in collaboration with internationally renowned designers and architects such as Doriana and Massimiliano Fuksas, Sottsass Associati, Pedrizzetti Associati, Maurizio Giordano e Roberto Grossi, Davide Mercatali, Valentina Downey, Itamar Harari, Studio Hot Lab, and Mazzer. Manital has expanded into international markets and now owns a sister company in Spain, plus a range of units located throughout Europe, Russia and Australia, Canada, the US, the Middle East, India and South America. In 2008, Manital obtained the ISO 9001 certification for quality. The company has also received many awards for its designs. Manital will be exhibiting at Stand B286, Hall 7, at The Big 5.